Just like last time, the photos tend to get more awkward as things progress. This week, I was going for a delighted/surprised expression. Nailed it. It has already been 25 weeks!? Baby Girl is the size of a baseball glove, or a prairie dog. It's weird to think she will be here in 15 weeks (ish)....to me, that sounds soon! Now that I'm almost on summer vacation, I feel like I'm in the homestretch. I remember how with Ella, things went by like a blur once I got to summer vacay! Changes I've noticed: I HAVE to stretch really well AND drink more water, especially before bed or else...charlie horses! Ahh, lesson learned two nights ago. I'm still limping. I've also got a dry skin patch (my mom diagnosed me with eczema) on my left cheek. It looks kind of like a big pimple. I do randomly get these dry patches every so often (once on my leg and once on my eyelid that I can remember), so I don't know that it's pregnancy-related. I've been using a cream on it, it's not helping but it's also not getting worse. Any eczema creams you swear by, please let me know! How I've been feeling: Exhausted. I'm tired of even saying it. It almost goes without say! Did I mention summer is coming? Hopefully then I won't feel so fatigued 24/7! How I've been sleeping: I woke up quite a bit through the night this past week. I'm able to fall right back to sleep so it's not a big deal. Last night I got over 10 hours of sleep. It was weird, but much needed! Food and exercise: This week hasn't been AS good as last week. No students at work always equals going out for lunch. Next week I'll start summer vacation AND my new challenge group....so, MAJOR changes are coming! I haven't been snacking at night, and I've been laying off the sugar! For exercise I've been sticking with yoga and lots of stretching (except for the night before the charlie horse from hell). 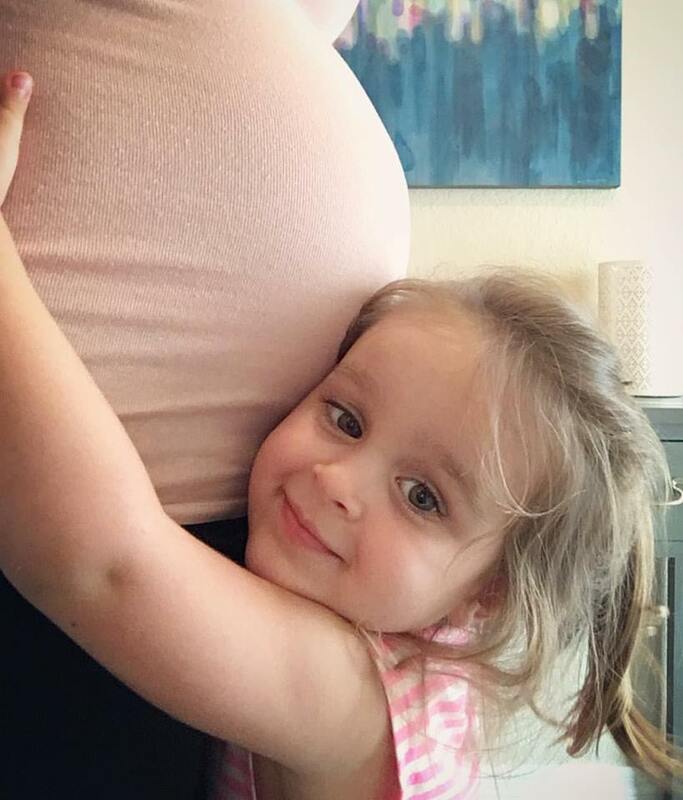 Maternity clothes: Non-maternity clothes that I expect to fit me...do not! It's not even worth trying them on anymore. Movement: Baby is still hanging out and poking me by my ribs. She also likes to stretch out a lot so I feel her in two spots, such a weird feeling! Also, Ella shoving an M&M in my belly button (what's left of it) and saying that she wanted to "share her special treat with Baby". Too cute, these are the things I want to remember! 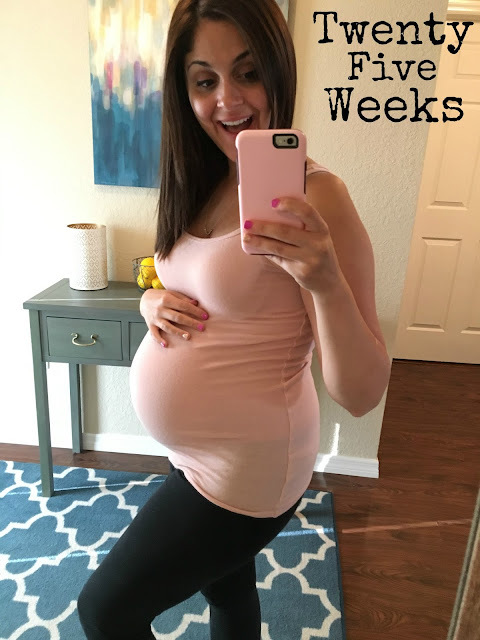 Click HERE to check out 25 Weeks with Ella Rose! Whoa....this is the first time I'm looking back and really noticing a major difference in how much BIGGER I am this time around! Hubby just said "maybe it's the angle"....love that man. Congrats!!! So happy for you my friend!